White Iris with 3 Blooms. Hardy white Iris with three flowers! 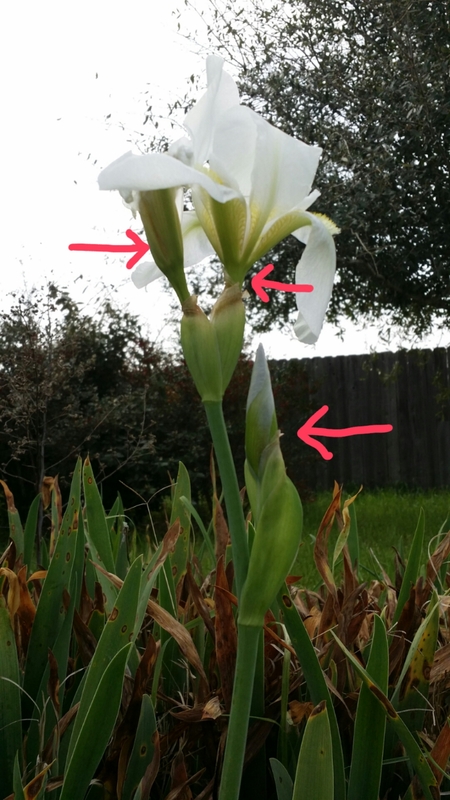 This “cemetery white” iris — Iris x Albicans — has 3 flowers on one stalk (see arrows). Normally, there is only one iris per stalk. I suspect this has something to do with the brutal winter we’ve had in this area (as well as the entire country). These irises generally bloom in mass, but the temperature dropped to 21 just as the buds were setting — all existing buds were destroyed. Damaged brown foliage below the flowers is further evidence of the sub-freezing weather. This Iris is often referred to as “cemetery white” due to it’s prominence in cemeteries. An extremely hardy Iris, it is one of the first plants to bloom in Spring, and it remains green throughout the summer, preferring dry roots (plant health declines when water sets on the roots). It is an extremely drought tolerant and water-friendly Iris. When the blooms appear after the last frost/freeze, this Iris puts on quite a show! Much going on in the garden now! Gladiolas make wonderful cut flowers in May and June, but wind, frost, and excessive moisture can cause problems growing these gems! While there are some native gladiolas for this area, I like to have a little more color, so I start mixed color gladiola bulbs early — in takeout food dishes that have been washed. 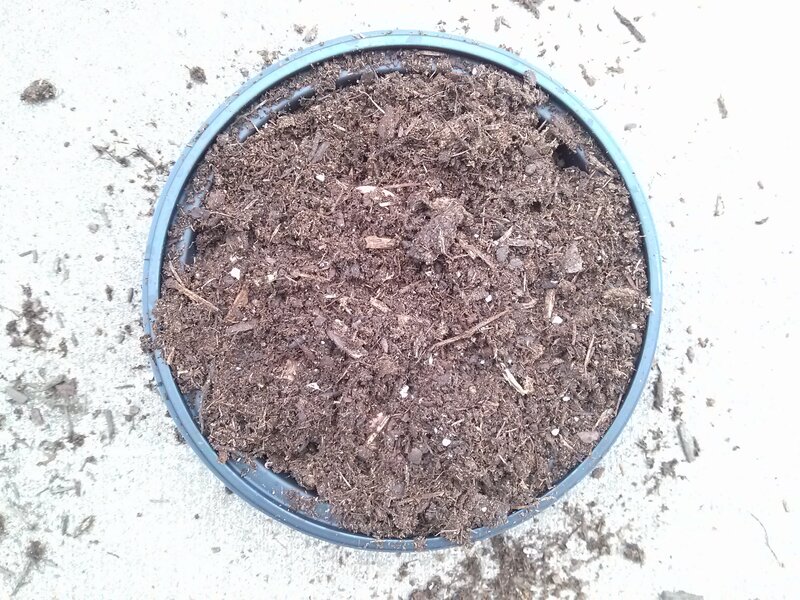 (1) place about 1 inch of potting soil into the plastic dish. 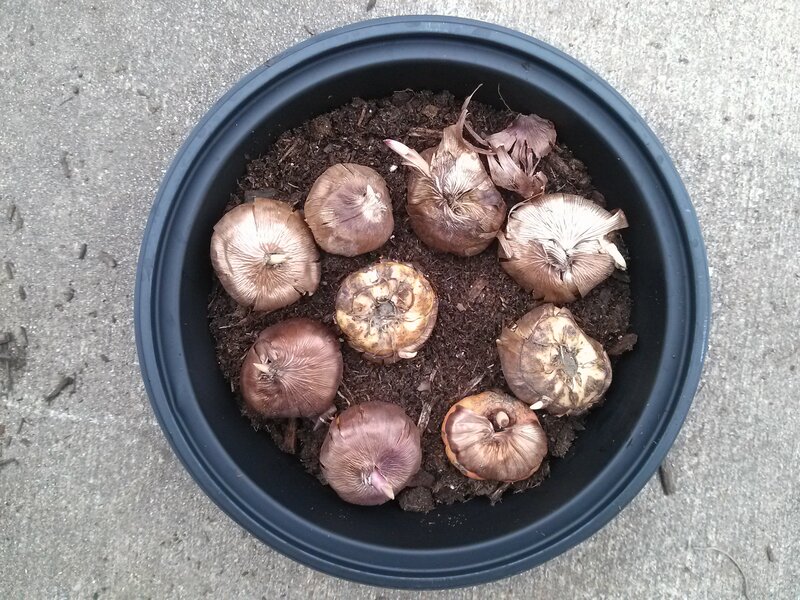 (3) Add just enough potting soil to cover the bulbs — there may be some emerging plant material above the soil. (4) water until the potting soil is damp, but not too wet (if pooled water is visible — it’s too wet — drain the excess water. Watch for the protruding plant material to turn green. Rather than tossing those plastic takeout dishes, save them for starting gladiolas — or other bulbs! I’ve also used the long, shallow tubs sold for wallpapering (at home improvement stores). They are relatively cheap and you can put quite a few bulbs in them. 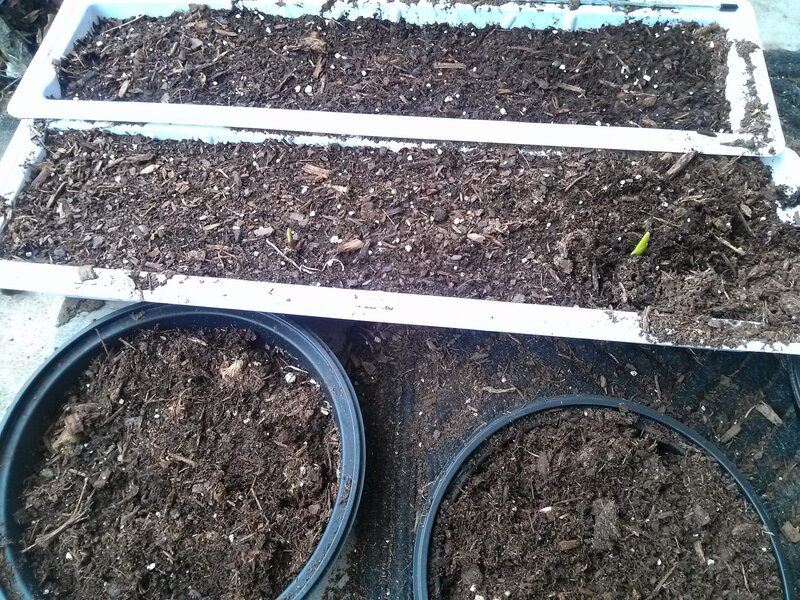 After about 10 days, the gladiolas have emerged (see long wallpapering container to the left). The transition from off white to green is a great sign! Wait until all danger of frost has passed, then either transplant the bulbs to pots (space plants according to instructions on the box — e.g., 3 inches apart) for fresh picked, long life gladiola flowers in May and June. Some bulbs may not survive — it always happens that way — no worries, take care of those that do emerge and you’ll have wonderful flowers for late spring or early summer. Finally — the plants may need support stakes to keep them from falling over. PS —- Once finished with the containers, wash and store them for next year. You won’t have to buy containers and these won’t end up in the landfill after a single use! Minor Flooding, Lush Greenery, and Calla Lilies! Three terms I did not think I would be using to describe my gardens in mid October — flooding, Calla, and Lush. My Spider lilies generally bloom when the high temperatures near 90 and low temperatures are about 70. For this area of Texas, that can happen anywhere from early April through June — this year has resulted in a later than usual bloom for my plants. 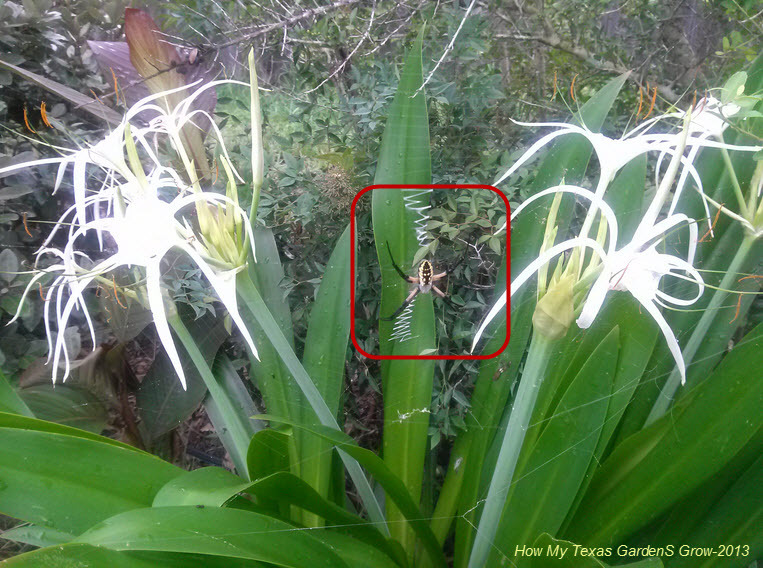 Closer inspection of the picture — area in red rectangle — reveals that the lilies have a spider guest. I just had to take this picture! My landscape includes spider lilies near areas that are shady in the afternoon and evening. Those lilies that were growing in the less shady areas did not survive the drought over the last few years. These receive drip irrigation when the temperature rises and rains stop. The last few days have been great — highs in the low 90’s and lows in the low to mid 70’s. We have been visited by a rather slow moving, light rain producing low pressure area trapped between two high pressure regions. Rain in July is rare!